Scroll down for the emoji list. Each name that appears as a link will pop up with a description and artwork. I 💜 it! In addition, at the end of this article there’s a terrific emoji guide for newbies infographic. Yeah, this is a long one, so better get started! 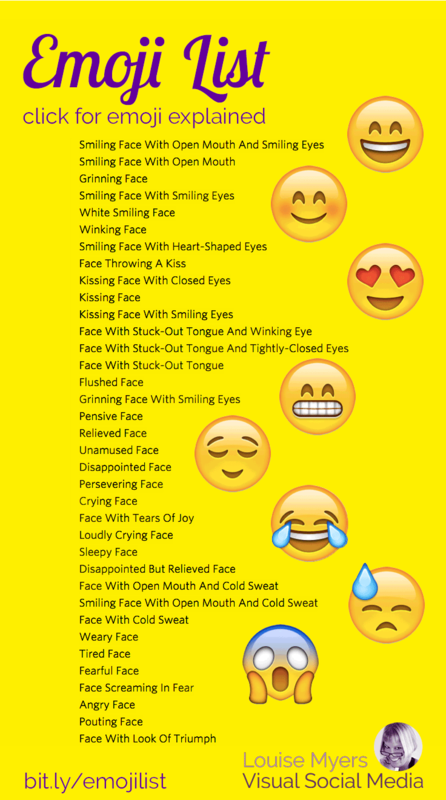 This post on emoji names and meanings was originally published June 2015, and updated July 2017 and March 2019. Scroll down if you just want to see the emoji list! How many emojis are there in total? There are 2,823 emojis in the Unicode Standard. The most recent emoji release is Emoji 11.0, which added 157 new emojis in June 2018. Believe it or not, 230 more are slated to be added in 2019. They’ll include people with disabilities and mixed-race couples. When was the first emoji ever created? In 1999 Shigetaka Kurita created the first widely-used set of emoji. He was part of the team working on NTT DoCoMo’s i-mode mobile Internet platform. When is National Emoji Day? What’s the most used emoji in the world? How many people use emojis? Right now, there’s an unprecedented interest in emojis. There was an entire book about emojis released on August 1, 2017: The Emoji Code. As well as a movie, creatively named The Emoji Movie. 😉 Have you seen it? One of my favorite pastimes is playing Disney Emoji Blitz. This fun app launched on July 14, 2016. A fast-paced match-3 game, Disney Emoji Blitz lets players match emojis to score points and unlock new Disney and Pixar emojis. Once an emoji is collected within the game, it is also unlocked in the Disney Emoji Blitz keyboard, which can be used to send Disney and Pixar emojis to friends in messages. 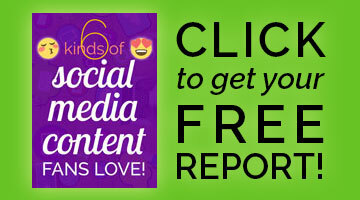 For more info about emojis, you may want to check my other posts on this topic. Try this #iPhone hack: Learn Emoji Meanings from Siri! By the way, there’s a site that offers free personal usage of emojis: EmojiOne. Click names that appear as a link for a pop up with a description and artwork. Click elsewhere on the page to close the popup. Don’t forget, after the list there’s an emoji guide for newbies infographic. 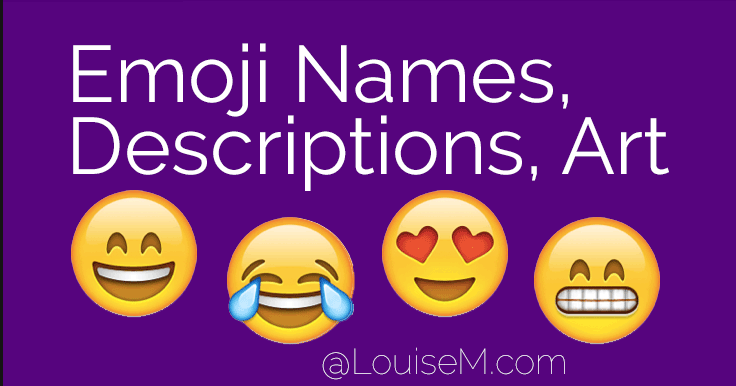 Pin this post so you’ll always have a reference to a list of emoji names and descriptions handy. Enjoy! Emoji means picture character in Japanese, and they’re a quick way to communicate. As attention spans decrease, the popularity of emojis is on the rise! This cool infographic is compliments of WhoIsHostingThis. Share the emoji list with a friend, and let me know your thoughts below!